Orissa with her glorious past has contributed immensely to the study of history of religious faith and movements of ancient India considered as a melting pot of various cults and civilizations The sacred Ksetra located at Pun is well known as Nilacala Sriksetra, Sri Jagannatha ksetra, Sri Purusottama ksetra or Sankhaksetra where the Lord Purusottama is worshipped as Jagannatha as the bestower of salvation. Kapila -samhita, a notable sthalapurana of Orissa (Written probably in 16th Century AD.) describes the deity Purusottama as the Lord of all deities and the Ksetra Purusottama as the king of all the ksetras. The description of this Ksetra in details is found in the Skanda-Purana in an independent section of its Vaisnava-khanda and Brahmapurana in about thirty chapters. It is also referred to in other Puranas like Visnu. Matsya, Garuda, Brahmamda, Agni and Padmapurana. Further, the Barhaspatya-sutram of 7th century AD. And Krtyakalpataru of Laksmidhara Batta (of 11 l0 AD.) describes the religious sanctity of this sacred place of pilgrimage. Besides these, many epigraphic records like a copper plate grant discovered at the village of Maihar of Satna district of Madhya Pradesh (10th century AD,). some plates of Dandi Mahadevi (10th century AD.). Brahmesvara temple Inscription at Bhubanesvar (11th century AD.) and various literary works like the Sanskrit Drama Anargharaghava of Murari (9th century AD.) and Prabodhacandrodaya of Krsna Misra (11th century AD.) etc. corroborate the facts regarding this Purusottama Ksetra. Further many Tantric works like Rudrayamala, Tantrayamala and Kilika-Purana refer to this ksetra as the heaven on earth and Darurupa Jagannatha as the giver of guarantee or promise of safety to the devotees. The Vedic God Visnu grew to be more powerful in later Vedic period and in Epics and Puranas he was regarded as the supreme spirit. Later he was identified with Visudeva Krsna. His said that the earlier people, probably Dravidians inhabiting Kalinga part of ancient Orissa were devoted Jainas worshiping Purusa and it is Anantavarman Codagarigadeva who brought the wooden deity of Jagannatha, abari Nirayana from Odra-part of Orissa and installed Him in the temple as Purusottama-Jagannatha, The present mode of worship is partly Vedic, partly Tantric and partly Puranic. The simultaneous worship of the deities together refers to the fact that although the images are seen in four different forms viz. Jagannatha, Balabhadra. Subhadri and Sudarana, they belong to one unit Caturthi-murti. According to Pancaratra form of worship, these four deities stand for Visudeva, Samkarasara, Pradyumna and Aniruddha respectively. The puzzling factor here is Subhadra, a symbol of female principle. The synthesis of four forms is also suggested to be derived from the Vedic Pranava (A.U.M and turiya). Although Vaisnavism became a dominant faith with the accession of Codanganga and Saivism was relegated to a less important place, still a synthesis was adapted in Jagannatha-cult representing Jagannatha and Balabhadra as Hari-Hara, Subhadra for Sakta and Sudarsana for the principle of Void or Nirguna Brahma. The famous five sage-poets of Orissa Viz, Pancasakhas of 15th century A.D. gave emphasis on the Yogic principle in Jagannatha cult. Even Lord Jagannatha is identified with Lord Buddha. The Uddiyana king lndrabhuti is said to have paid obeisance to Jagannatha in the opening verses of Jnanasiddhi, although it is doubted to which Jagannatha he prayed. He might have seen Jagannatha, the Universal Lord in Buddha, Himself. However, later Buddhists as well as Hindu scholars have identified Jagannatha and Buddha. Thus the “Dharmapuja vidhana” declared in no uncertain terms that in the ninth incarnation God was born as Jagannatha who was none but Lord Buddha” to unite together the Hindus and the Muslims of Orissa. Be they suffi-saints, the followers of kabir, or the Sikh poets, the followers of Guru Nanak, the Natha-yogis or the Philosophers of different systems of Indian philosophy, the Buddhists, Jainas or the followers of different sects of Hinduism all have tried to identify their essence in Jagannatha, The cosmopolitanism in the concept of the deity has greatly influenced the manners and behaviour of the people of Orissa and thus the institution of Jagannatha has become a part and parcel of all spheres of life of Orissan people. Here is an anthology of papers “Aspect of Purusottama Jagannatha” devoted to this unique concept of Lord Jagannatha. On this occasion. I congratulate the authors who have been enriching this field of study through our Research-Journal ‘Jagannutha-Jyotihi’ Special thanks are clue to Dr. BK. Swain, the Director of our Research Centre for compiling these papers and Shri Jagannatha temple foundation fund for providing finance for this publication. The thoughts expressed here are varied, extensive and may be sometimes speculative. But such a publication will continue to inspire the general readers and scholars who have curiosity to know our ancient past and who have love for such interdisciplinary scholarship. May Lord Jagannatha bless us all. Sri Jagannatha is treated as Purusottama from time immemorial. His different aspects are dealt with from different standpoints in different texts of different schools of Indian philosophy in general and the Vaisnava Philosophy in particular. As a matter of fact worship of Purusottama Jagannatha is ordained in accordance with the very dicta of Pancaratra school of Vaisnavism. However, Saivism, Saktism Jainism and Buddhism have been intermingled with it as its very components. Although a number of scriptural texts belonging to Pancaratra school have been written in connection with Purusottama Jagannatha, still scholars of this line are found to have been engaged in historical research. Research in Philosophy and religion of Purusottama Jagannatha is very scant. Text based research in this area is still less. Those who have done research in this area have confined their study only to the puranic source, as the result of which sources of Vaisnava-Agama have been relegated to the background. Scholars who have taken attempt to enter into this area have been accommodated in the circumference of Niladrimahodaya or Vimadevasamhita etc. 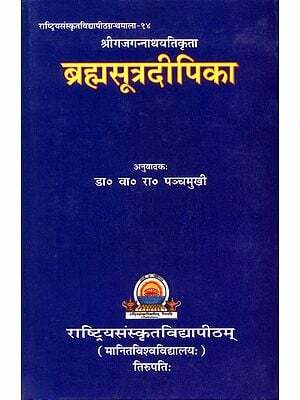 A vast literature of Pancaratra School of vaisnavism, as we understand, is yet to be resorted to. Here, in this collection, we find a very norm of Purusottama as the religion of man. 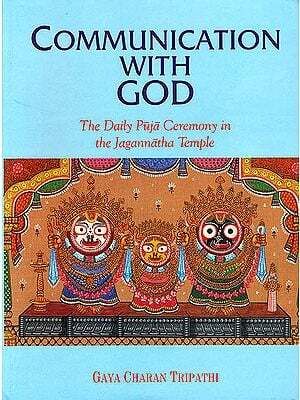 Dr. Satyabadi Mishra has given here a Vedantic outline of Purusottama aspect of Jagannatha. While Prof. Tantra Pattanayak, in giving a line of thinking emcompassing Buddhism, Jainism, Tantrism etc. has mainly concentrated on sabara-aspect dealing with Orissan Buddhism. Prof. Srinibas Tripathy, in a scholastic manner, has looked into the core of interaction between Jesus and Jagannatha. From historical point of view it is yet to be analysed further. Prof. G.C. Nayak’s Vision of thought on the Philosophy of .Jagannatha is emotional, because, he has taken into account the heart-felt devotion of Dasia-bauri along with Sankara’s advaitic realisation. Prof. A.C. Sarangi, in his lucid style has analysed Adhyatma dharma and Jagannatha-dharma according to Pandit Nilakantha Das. He concludes that ‘a man born as a biological being, develops himself into a full citizen ready for social service when he is able to see Purusottama Jagannatha in all his creations through the practice of harmonious as well as complementary paths of Bhakti, Jnana and Karma as taught by the Srimad Bhagavad Gita”. Dr. Ray’s article, here, is the only article which deals with a particular text i.e. Niladrimahodaya. However, she has exhibited a number of attributes of Purusottama Jagannatha from different sources. Basically Sri Purusottama Jagannatha has been established as Ningha, but subsequently been ardently worshipped as Sri Krsna. The compiler of this work has dealt with this aspect with textual evidence, which has a lot of historical foundation. Dr. R.C. Mishra has put forth the economic aspects of Jagannatha Pun since Pun is a place, according to him, of pilgrimage as well as a place for tourists interest. Unlike other articles, Dy. BK. Nayak’s article presents a description of Jagannatha and His eulogy in Sanskrit; He has covered a vast literature of Sanskrit from g Veda to Vakravak Chakrapani Pattanaik’s Gundicacampu. Thus many aspects of Purusottama Jagannatha have been dealt with in this collection with a some what synthetic vision of mind. Prof. Dr. AC. Sarangi the Honourable Vice-Chancellor has given a befitting foreword to it. Prof. Dr. P.K. Mishra, the Registrar and Mr. D.K. Mukherjee, the Comptroller of Finance of the Visvavidyalaya have given their ungrudging help and support to the publication of this work. The compiler grateful to them. He will be failing in his duty if he does not express his thankfulness to Maa Mangala Press for their tireless effort to bring this volume in time. Last but not the list, the compiler owns of his moral responsibility in case of errors if any.